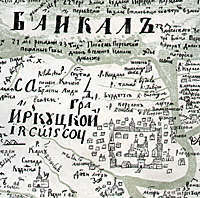 “…on July 6 czar’s new fortress is being built by men in service on the place, opposite the Irkut river on Verholenskii side, a tower and a ceiling have been made…” – Yakov Pokhabov, Eniseiskii son of a boyarin (chief) , reported the Eniseiskii military ruler on the day of Irkutsk fortress foundation (July 6, 1661). Irkutsk fortress had a shape of a rectangle (size 19 x 17 m). 20 Cossacks under a command of a Cossack foreman Vasilii Ezdakov lived there. People began to settle near the fortress because lands were fertile, rivers and forests were rich in fish and game. The fortress became crowded and small. In 1670 a new fortress was built under a man in service Andrei Berneshlev, which had a shape of a square (each side was 50 sazhens (sazhen is 7 feet)). The fortress was reinforced by 8 towers with a main Spassky tower in the center of the wall, facing the Angara river. There was a road from the river towards this tower. In 1672 a wooden Spassky church was built in the center of a fortress, ten years later a tented bell tower was added to the church. Men of order yard appeared inside the fortress. In 1684 an order house and a ruler’s house were installed into fortress wall. 1693 – new reconstruction date of Irkutsk fortress, which received a city status. It became one of the most beautiful cities in Siberia. Fortress size increased; “cut” walls, new towers with watch platforms and carved railings were erected. Spassky tower was the only one, which remained out of all towers. The main passing street became octagonal Sergievskii one. There were guest yard with 11 “state” shops, special wooden house, where guest merchants stayed, customs house, barns and cellars in Irkutsk fortress according to 1697 inventory. In 1716 a strong fire broke out in Irkutsk fortress, which destroyed fortress constructions and Spassky church. A stone Spassky church appeared on a previous church location. This monument can be seen nowadays. In 1730s general-Governor’s house, provincial office, Court Chamber were located on the territory of the fortress. By the late XVIII century Irkutsk fortress had lost its administrative and economical significance. In 1790 the fortress remains were dismantled. Irkutsk fortress (ostrog) was founded on a present sacred place. There a Memorial complex was erected in honor of Irkutsk heroes, who died in Great Patriotic War years.